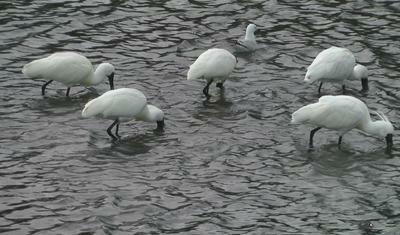 'Spoonbills' - not for the faint hearted. Thought I might share some shots taken on Friday afternoon, since I spent all day yesterday stabilising and converting to ‘Pro-Res’ 57 clips into 93 shots occupying 55gB of computer space. Above are a few clips from the overall collection. The light, on-the-day was not great, with cloud cover more or less continuous, but the light variable. 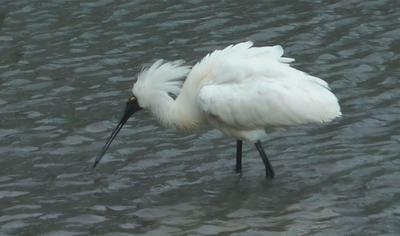 I plugged away for about an hour, concentrating on a group of ten spoonbills all feeding together. This is not work I would recommend for the faint-hearted, as the birds tend to take off in their own directions, only occasionally coming together in groups which represent reasonable grouping of them, allowing for some composition of shots. up nicely, just to have two of them wander out-of-frame and ruin the shots. abruptness, and we all parted friends. The backgrounds for some of the shots are not ‘great’, as the shallows shown are right at the top end of Anderson’s Bay Inlet, about five minutes walk from ‘home’, down quite a steep hill. While all this was going-on, cars were passing in a continuous stream, with vans, large trucks, people walking dogs which barked and so-on. Also, I had to pick up my tripod off the pavement on occasions so that groups of people could pass, so, as well as a trial of my concentration, it was also very much a trial of patience. At one stage, for example, an unaccompanied dog went right down to the water-line and barked menacingly at the birds; upon such disturbances, they usually head out into the safety of the inlet’s deeper water. 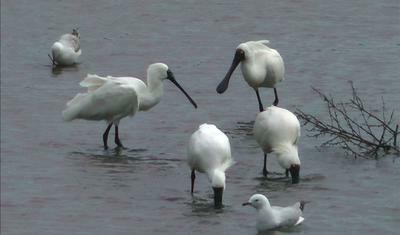 the time and the spoonbills had intruded into an area usually occupied by gulls, which is why ‘they’ continuously seem to be getting-in-the-way. The worst instances of that are when they fly right through shots and ruin them. Remarkably, fewer than five shots of the total were thrown out, and in most of those the birds had been in-focus, but wandered ‘out’, (I always focus manually, never on ‘auto’). These are full-frame stills from movie-frames, which have been subjected to minimal interference in the way of ‘Photo-shop’ etc, so after colour-grading they will likely look a great deal better. 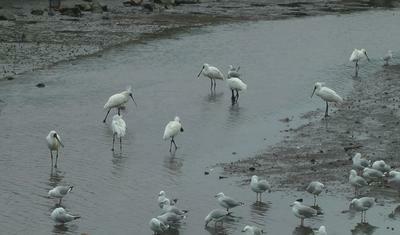 Despite the fact that some of them may look as if they are black-and-white shots, they are, in fact all in colour. Actually, I don’t really mind them that way as I would rather they came across well as monochromes, than 'tart' them up with colours which never really existed. Comments for 'Spoonbills' - not for the faint hearted. Your quaint difficulties with filming reminded me of a similar situation. I was fishing from shore in Chicago's, IL. USA shoreline. I was using a 12 foot bamboo pole. I baited my hook and with an over head toss hoped the hook would be way out from shore. There were gulls all around, causing one to duck as they flew over head and would "drop something." On this particular cast, I snagged one on its wing, and it flew round and round, screaming wildly. Round and round it kept flying as I had to keep pivoting to keep looking at it. This was about this time that people flew model airplanes on pair of wires called control lines. Well this bird was going round and round and people commented what kind of airplane is that. Finally I got the bird close enough to attempt to remove the hook from its wing. Biting and screaming at me, I finally was able to release it and it flew straight out into the lake. Thanks for the memories of that day.